Senate Minority Leader Chuck Schumer shared his suggestions for a federal framework for sports betting. 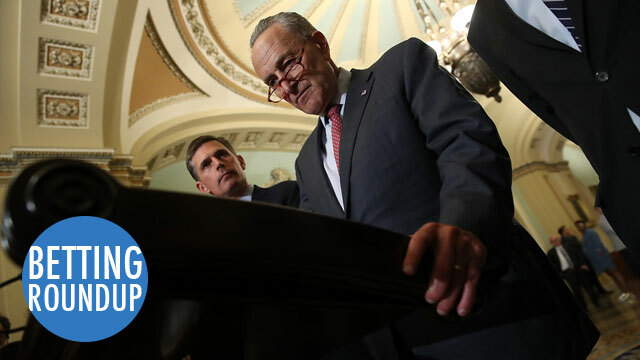 Schumer’s suggestions include the idea that all sportsbooks only use official league data to determine outcomes and that the sports leagues themselves should be involved in determining what bets would be accepted. Schumer also suggested leagues would have to reasonably step up monitoring, but did not mention so-called “integrity fees,” the idea that leagues should be paid a portion of bets on their sport as compensation for ratcheting up security associated with sports gambling out in the open. The first legal sports bet in West Virginia will be placed tomorrow. Sometime before noon Saturday, the first legal sports betting ticket will be sold in West Virginia, as Hollywood Casino in Charles Town becomes the first of five state casinos to offer sports betting. Workers continue to put the finishing touches on the new sportsbook, the lounge area that will feature nine betting stations and nearly three-dozen big-screen televisions. Staffers are going through the final paces of training on new sports betting machines. Connecticut lawmakers said there won’t be any state legislation on sports betting until at least next year. Lacking the votes to pass a bill legalizing sports gambling, House Speaker Joe Aresimowicz said there will be no special session on the topic this year. The change marks a sharp turnaround from nine months ago when lawmakers said they were far ahead of other states in laying the groundwork to prepare for sports betting. A representative from Major League Baseball said in April that Connecticut had the chance to pass model legislation that would be emulated by other states. But those days have passed. “We’re going to be behind the curve with neighboring states,’’ Aresimowicz said. Aresimowicz said it was “foolish’’ for Connecticut to drop the idea for now because the state could have received millions in revenue. While estimates have varied, nonpartisan analysts have said the state could receive $20 million a year from sports betting. “We’re leaving that money on the table,’’ Aresimowicz said. Sports broadcaster Al Michaels has been known for his indirect sports betting references on the air, but the subtlety could soon go away. A change in federal law that will hasten the spread of legalized sports betting won’t alter his approach, though he predicted that with time, the wink and grin won’t feel quite so playfully verboten. Both the NFL and its broadcast partners have a curious new dilemma to grapple with this season. With sports betting largely destigmatized and no longer federally outlawed, networks and their on-air talent must decide whether gambling references have a place in game broadcasts and related programming, much as fantasy football content has for years. Network producers and executives say it’s too early to expect the broadcasts to feel or sound significantly different, even if the interest and availability of sports gambling will be higher this season. For starters, there’s language in the contracts between broadcast partners and the league that bars overt discussions of sports gambling.